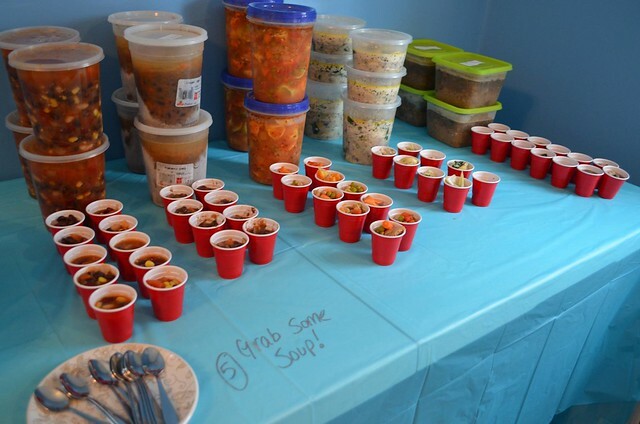 On Saturday, I hosted one of the most fun get-togethers I’ve had in a while – a soup swap party. It was like a cookie swap, but more appropriate for January weather. Everyone brought 4 1-quart containers of soup for swapping and then some extra to sample. 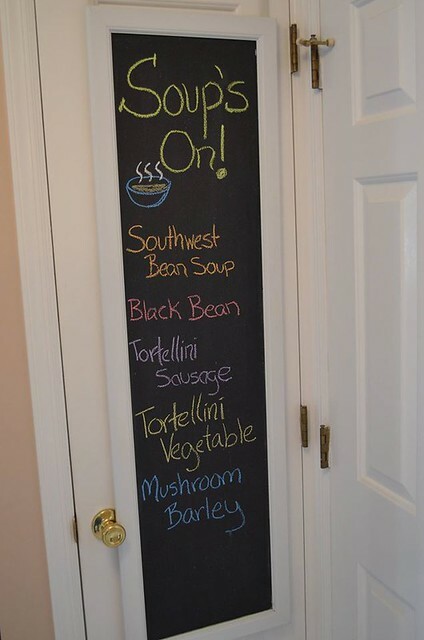 As everyone arrived, I noted their soup on a chalkboard right outside the kitchen for everyone to see. To go along with the soup, I set up a DIY grilled cheese bar for lunch. It was super easy and super fun. Since things were super causal, I just laid out ingredients on a disposable table cloth and made quick notes to explain the flow of things and label ingredient choices. 1) Grab some bread – I had out wheat and white. 2) Add some cheese – there was a choice of American, Jalapeno Cheddar and Swiss. 3) Top it off – personalize your sandwich with regular mayonnaise, garlic mayonnaise, sriracha mayonnaise, ketchup, tomato slices, roasted red peppers, pickles, caramelized onions, pear slices, bacon and ham. 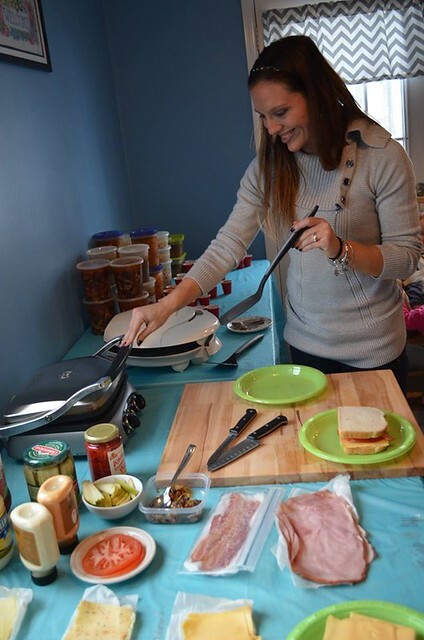 4) Heat it up – I had out two panini grills for toasting the creations. And 5) Grab some soup. We heated up some of everyone’s soup and divided them into shot glasses. Add mini spoons and they were perfect for sampling! After we’d eaten, we voted on soup awards and the winners took home mini bags of chocolates as recognition. For favors, I found microwavable soup mugs at my favorite dollar store. I added mini loaves of homemade bread too, since they seemed like the perfect soup accompaniment. For the kids that came, I filled their soup mugs with baby Goldfish crackers and picked out some fun coloring books. At the end, we divided up the soup so everyone left with 4 quarts of soup. 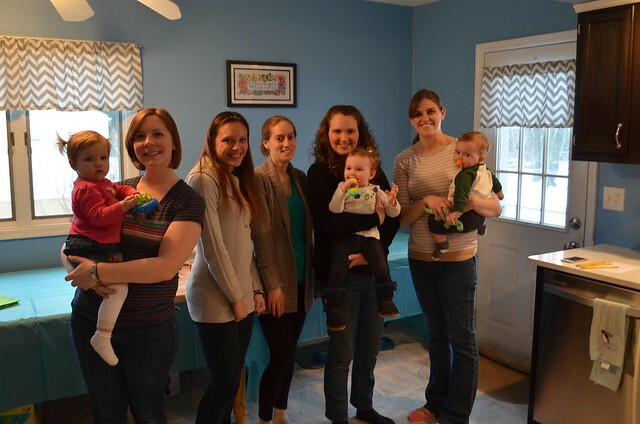 It was such a fun way to spend a snowy afternoon – I’m already looking forward to next year’s soup swap! Such a fantastic idea! Definitely going to try and put a party on next winter with friends and family. A few years ago I had a Christmas Party and I sent out invites that I was having “A Souper Chili Party “. I made a couple of soups and chili with baked potatoes, as some like to put chili on the potatoes. Had a nice crusty bread and everyone was happy. It was easy and a great time was had by all. Looks like so much fun! Love this!! The soup mugs were from a local dollar store – as were the containers I used. Everyone supplied their own containers! What a fun and great idea! Did you have everyone bring their recipe to hand out? I didn’t because I didn’t think of it! I had used Facebook to invite everyone so we all posted our recipes to the event afterwards. Next time, I’ll ask people to bring copies! Loved the party idea! Great! I love hosting “parties” like this. Next time you do a soup party, pick a soup recipe that is different than the ones being ‘swapped’ then have each person bring an ingredient for it. When everyone arrives you can all make this soup, enjoy the sandwich bar while it cooks, then divy it up for everyone to take home their share. The chalkboard was actually a super-easy DIY project! We bought a cheap over-the-door mirror during the back-to-college sales, my husband roughed up the glass slightly with some fine sandpaper, and then he painted over the mirror part with chalkboard paint. I’m curious how many people (adults) were there. Looks like there were 5 kinds of soup. Does that mean you only invited 4 people or some people brought the same thing? There were 5 swappers for the party – we were actually expecting more, but half the crowd got snowed in!